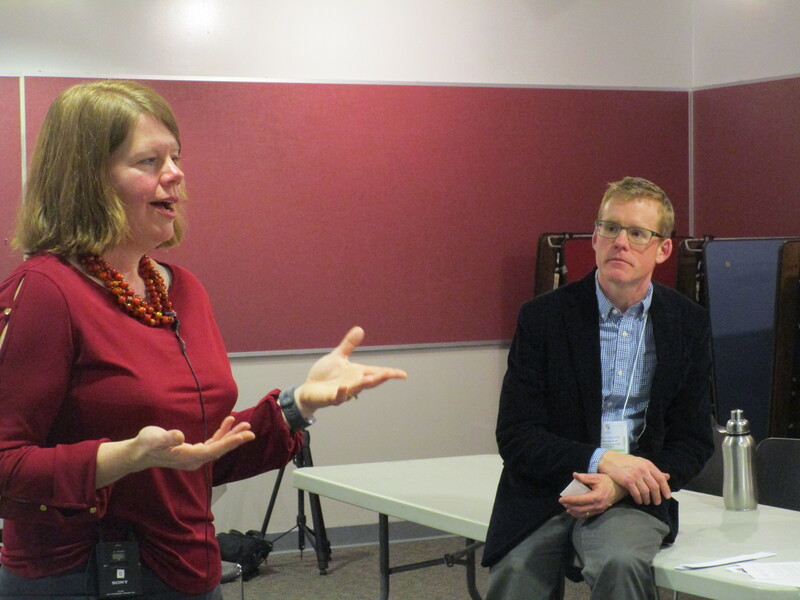 The Arts Commission is providing a one-day professional development workshop for Maine Teaching Artists. Viles Mansion/Governor Samuel Cony House, 71 Stone Street, Augusta. The workshop is focused on the role and benefits of a teaching artist. We will address how to structure and market a residency as well as tips for communicating and collaborating teachers, administrators, and community arts representatives. The workshop will include resources and techniques on applying your expertise as an artist to the structure of your work as a teaching artist including communication tips, connecting standards and assessments in your lessons, promotional information, funding opportunities, messaging and much more. Information on applying your expertise as an artist to the structuring of your lessons and residencies. Hands-on experience in relating the learning standards and assessments to your work. 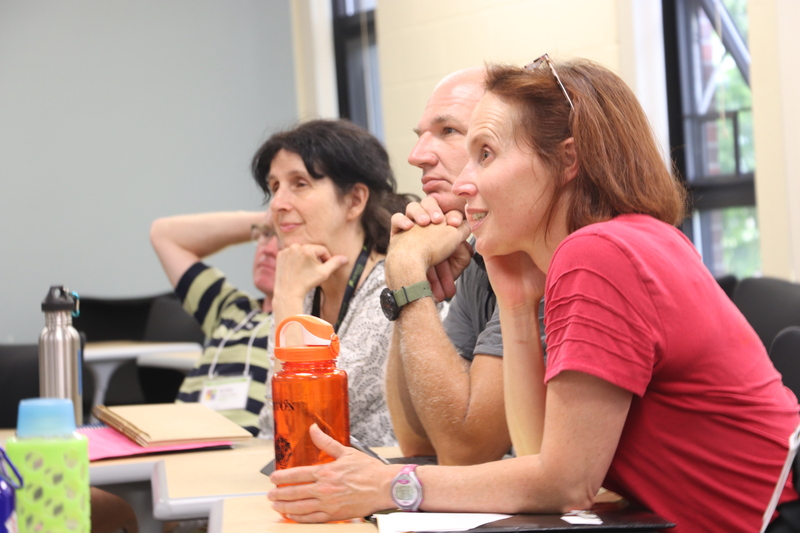 Participation in sessions that are planned to fit your specific needs as a teaching artist. Please note: To be eligible to apply for the Maine Arts Commission Teaching Artist Roster teaching artists must attend the one-day workshop. January 31, 2019, 5:00 p.m. is the deadline for the Maine Arts Commission’s dance education grant for PK-12 schools and teaching artists. Applications must be filed using the Commission’s online grants management system at www.MaineArts.com. Launched in 2015, the dance education grant provides high quality learning opportunities for students and educators in schools where dance education is not being offered. 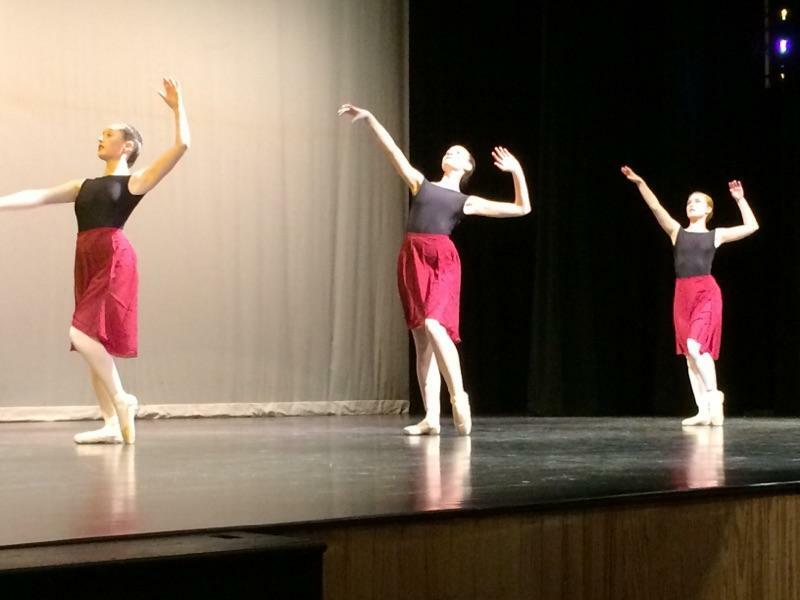 Dance education changes lives, yet only 5 percent of all schools in Maine offer opportunities in this artistic discipline, according to the Arts Education Census study conducted in 2016 by the Maine Arts Commission. During this past grant cycle, the program funded artist residencies at Maranacook Middle School in Readfield and Freeport High School. Both residencies are taking place during this school year. Nancy Salmon is the teaching artist on the Maine Arts Commission’s Teaching Artist Roster who is providing instruction. You can read the stories of past recipients of the dance education grant. Six schools have been awarded funding during the last three years. 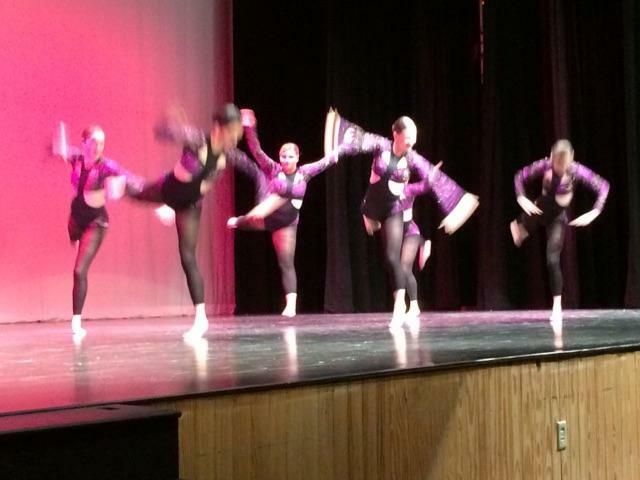 You can read about the success stories on this blog by searching using “dance education”. Funding for this program is made possible through the generosity of an annual dance performance in November called “Fall Into Dance”. 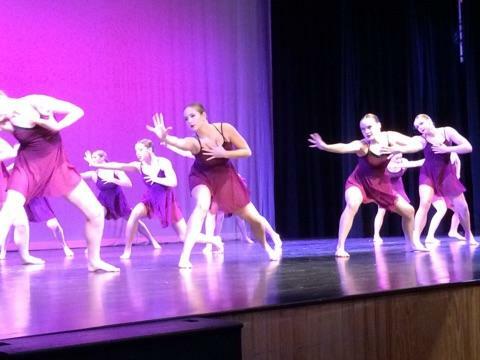 This year two schools and ten dance studios collaborated to put on the performance. It is facilitated by Thornton Academy dance educator and Maine Arts Leadership Initiative Teacher Leader Emma Arenstam Campbell. This year the event raised $3,810.00. To date the dance education grant has awarded $17,421.00. Dancers Making a Difference contributing one year to this grant in addition to the funds raised by Fall Into Dance. All of this money goes directly to schools to create a dance education opportunity that works towards establishing dance education programs. Clear demonstration of high-quality arts education teaching and learning opportunity. Evidence of significant collaborative planning among teachers and other partners, and the capacity to carry it out. Clear demonstration of equity and access to learning addressing the differences of learners. Description of evaluation methodology with clear objectives and outcomes. Commitment beyond the conclusion of the project. Grant guidelines and application criteria are at www.MaineArts.com and the Commission encourages PK-12 educators or teaching artists to review them prior to applying. The funding cycle for these grants is for projects from September 1, 2019 through March 30, 2020. Applicants may apply up to $2,500 and are not eligible if they’ve applied in the past. For more information visit the grants and the teaching artist roster webpages at www.MaineArts.com. Watch for a notice announcing when the application will be available. Begin planning and be sure and communicate about your ideas with Argy Nestor, Director of Arts Education at 207-287-2713 or email at argy.nestor@maine.gov. 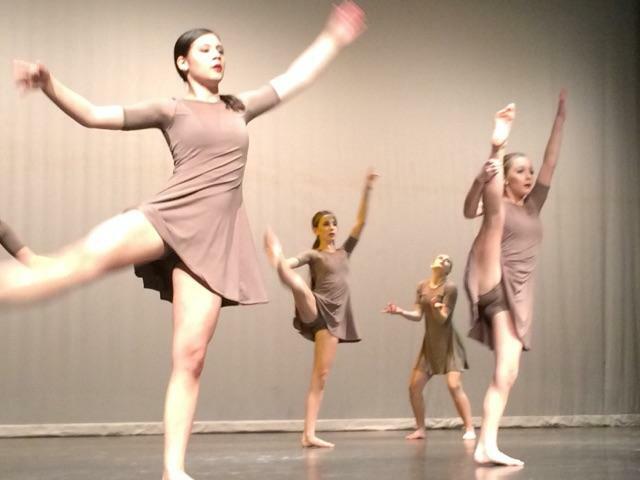 All photos in this blog post were taken at the November 2018 Dance Into Fall performance at Thornton Academy. 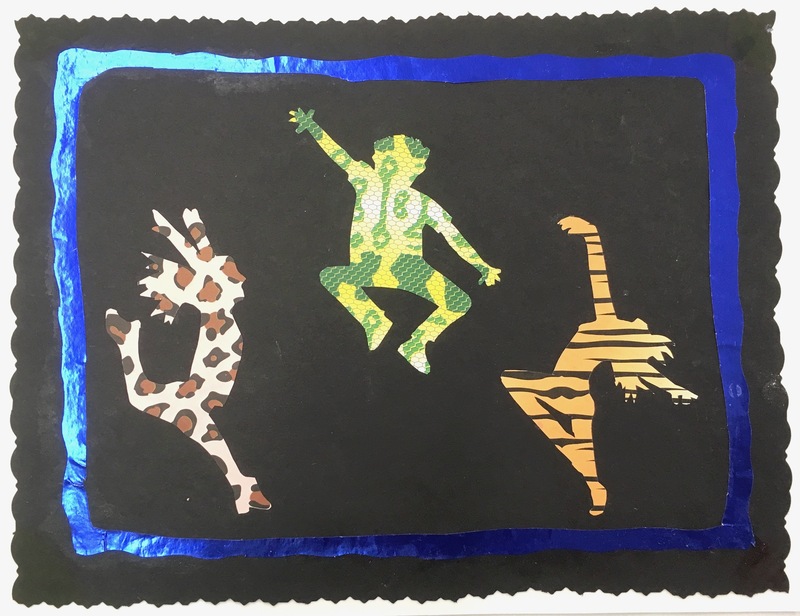 This collage was created by Amber Pendleton who was in 5th grade at the time when Teaching Artist Chrissy Fowler provided a dance residency at Prescott Memorial School in Washington. She was working with art teacher Anthony Lufkin and a Maine Arts Leadership Initiative (MALI) Teacher Leader (MAL) in a Gifted and Talented art class. This was Amber’s response to the fabulous opportunity. The residency took place with funding from the Maine Arts Commission Dance Education fund. This fund was established by a MALI dance teacher at Thornton Academy, Emma Arenstam Campbell. If you’re interested in bringing dance education to your school please watch for the information coming soon on this blog for the 2019-20 school year. The dance performance that has provided the funding for this grant will take place at Thornton Academy on Friday, November 16, 6:30 p.m. Only dance educators on the Maine Arts Commission Teaching Artist Roster are eligible for the funding. Please consider reaching out to one of them and begin planning for next year. This funding has been in place for three years and hundreds of students in grades Pre-K through 12 throughout Maine have benefited from the opportunities it has afforded. If you have questions please don’t hesitate to contact me at argy.nestor@maine.gov. Many of you know the Maine film maker – Huey. 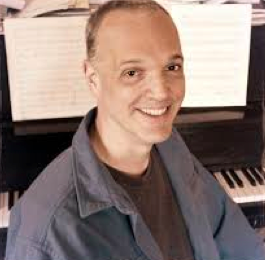 He is on the Maine Arts Commission Teaching Artist roster. I understand if you want to see a beautiful film perhaps you can catch one of the showings of Huey’s film Henry David Thoreau: Surveyor of the Soul. Over the next two weeks it will be shown several times. Huey himself along with some of the people interviewed in the film will be present as well. October 20, 10 a.m., Dietrich Theater, Tunkhannock, PA. With guests featured in the film: Rochelle Johnson, Professor of English & Environmental Studies at the College of Idaho and Sandra Harbert Petrulionis, Professor, Penn State Altoona and author, To Set This World Right, The Antislavery Movement in Thoreau’s Concord. October 24, 7 p.m., Twilight Auditorium, 101, Middlebury College, Middlebury, VT. With guest featured in the film, Matt Schlein, director Walden Project, Vergennes High School Vergennes, VT and Rebecca Kneale Gould, Associate Professor of Environmental Studies and member of the board of the Thoreau Society. Every so often I meet educators who are not familiar with Visual Thinking Strategies or VTS as it is commonly called. Waterfall Arts, a community arts center in Belfast, provides a program using VTS. 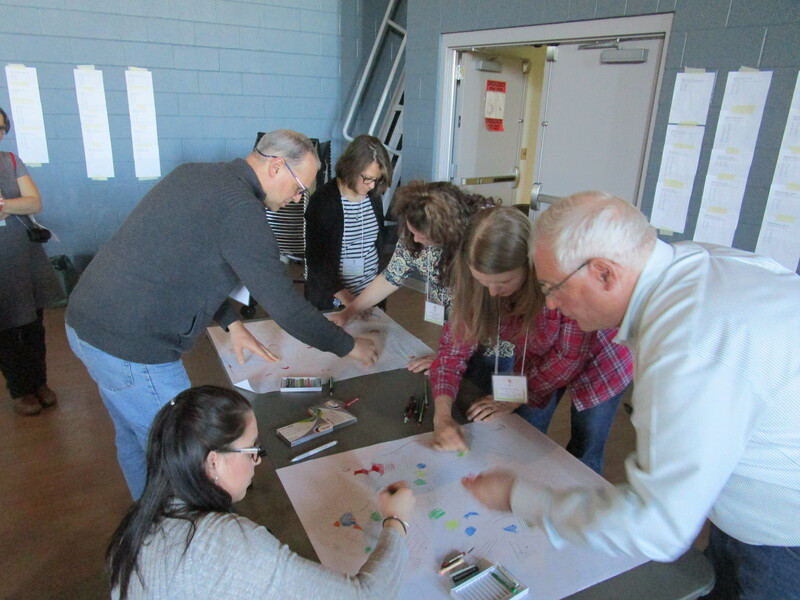 As part of their outreach efforts of the Youth and Family Outreach (YFO) program at Waterfall Arts, program coordinator Bridget Matros offers Visual Thinking Strategies training to teachers in area schools. These strategies are activity used in the YFO after school programs and are also utilized in field trips to Waterfall Arts. Teaching Artist Bridget Matros has put together the information below (taken from the VTS site). Thank you Bridget! She is also on the Maine Arts Commission Teaching Artist roster. Waterfall Arts programs are comprehensive and they provide multiple programs for learners of all ages. 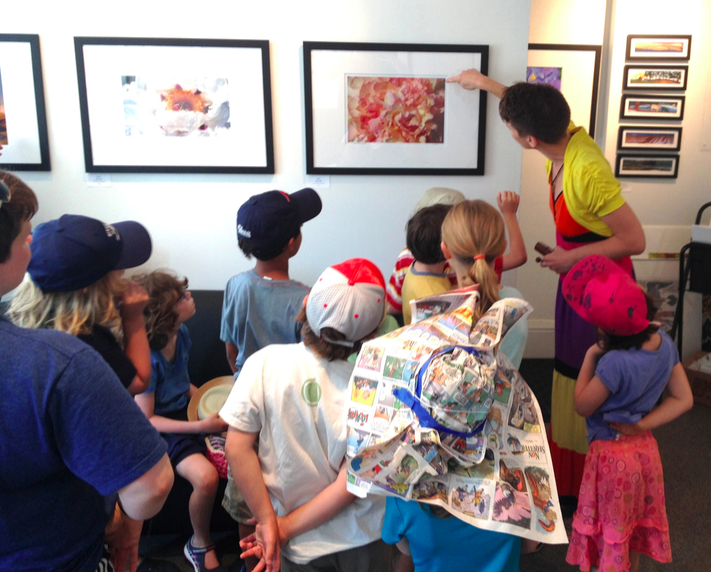 Many teachers in Maine, visual arts and others, use VTS in their classrooms. Several years ago we provided an all day workshop on the topic. Once reading this blog post, if you’re interested in learning more please contact me at argy.nestor@maine.gov. Visual Thinking Strategies (VTS) is a method initiated by teacher-facilitated discussions of art images and documented to have a cascading positive effect on both teachers and students. It is perhaps the simplest way in which teachers and schools can provide students with key behaviors sought by Common Core Standards: thinking skills that become habitual and transfer from lesson to lesson, oral and written language literacy, visual literacy, and collaborative interactions among peers. VTS provides a way to jumpstart a process of learning to think deeply applicable in most subjects from poetry to math, science and social studies. Art is the essential first discussion topic because it enables students to use existing visual and cognitive skills to develop confidence and experience, learning to use what they already know to figure out what they don’t; they are then prepared to explore other complex subject matter alone and with peers. In VTS discussions teachers support student growth by facilitating discussions of carefully selected works of visual art. What’s going on in this picture? The Maine Arts Commission (MAC) invites Teaching Artists to a one day professional development opportunity on Friday, June 22, 2018, 8:45 a.m. – 3:30 p.m. The workshop will take place at Viles Mansion/Governor Samuel Cony House, 71 Stone Street, Augusta. The cost is $25.00 and the workshop is limited to 20. REGISTRATION is available. Whether you are a veteran teaching artist looking to build on your practices and expand your reach in the PK through grade 12 environment, or a new teaching artist looking to be included on the Teaching Artist Roster and start working in the schools or community arts programs – this workshop is for you! The workshop is focused on the role and benefits of a teaching artist. We will address how to structure and market a residency as well as tips for communicating and collaborating with educators (including teachers and administrators), and community arts representatives. Participation in sessions that are planned to fit your needs as a teaching artist. Promoting yourself and your work as a teaching artist. Learn more about the MAC Teaching Artist programand visit the Teaching Artist roster. 5.5 teacher contact hours are available for attending all day on June 22. NOTE: In order to apply for the MAC Teaching Artist Roster, artists are required to attend the workshop on June 22. The Commission will be accepting applications for the roster in the fall of 2018. If you have any questions please contact Argy Nestor at argy.nestor@maine.gov. If you need a special accommodation to fully participate in this event please contact Kathy Shaw at kathy.shaw@maine.gov by June 8. 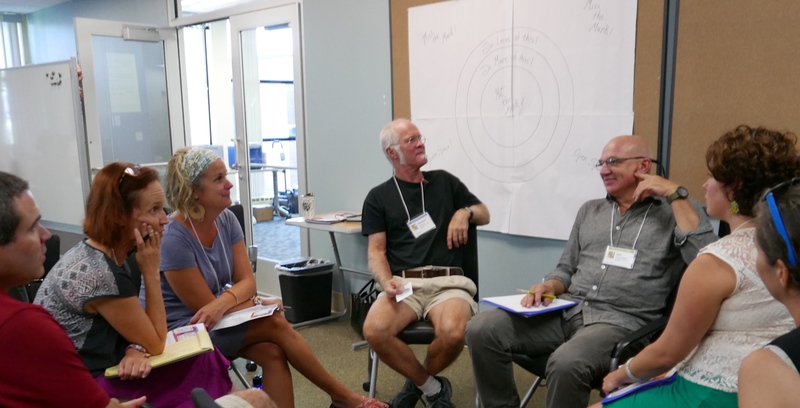 Dagney C. Ernest, writer and friend of arts education wrote about Tom Luther, musician and Maine Arts Commission Maine Arts Leadership Initiative Teacher Leader in the Village Soup. Read about Tom Luther and how is artistry has helped him work his way back from two strokes. 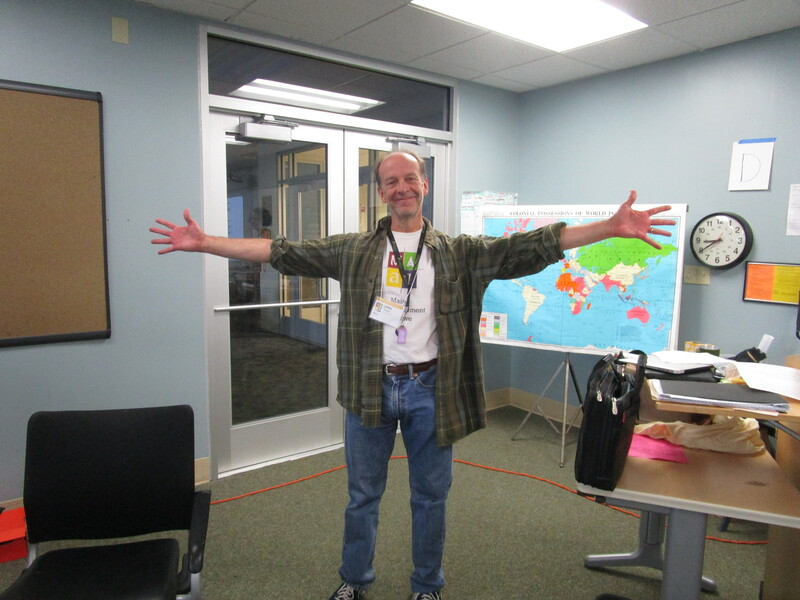 Tom’s Teacher Artist Leader story was published on this blog on April 10. Tom is a member of MACs teaching artist roster. 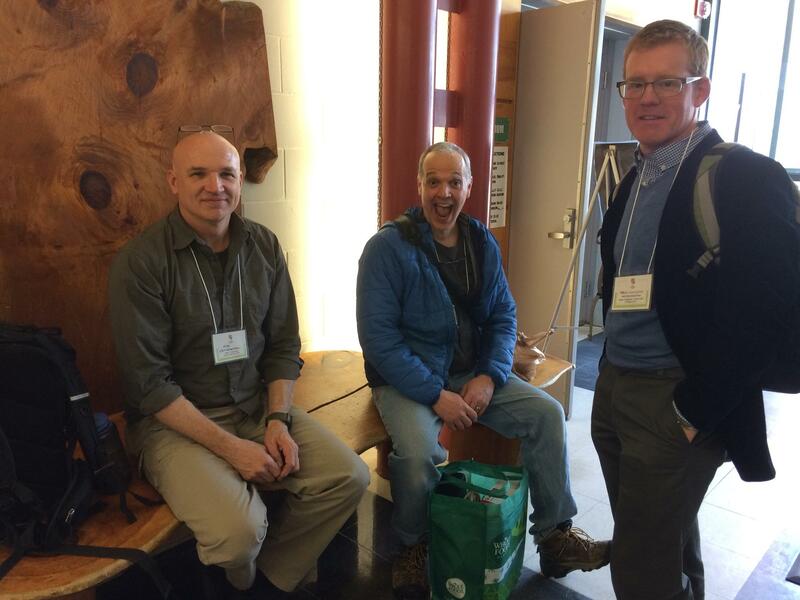 Yup, Tom’s in the middle with teaching artist leaders, Tim Christensen (L) and Brian Evans-Jones (R) at the Mega MALI conference in March at Oxford Hills Regional High School. All three presented sessions!